After Phuket, Koh Samui is Thailand’s largest island, and it’s also one of the most popular, especially for beachgoers looking for long stretches of white sand and clear water stretching to the horizon. Koh Samui doesn’t draw the numbers of tourists that Phuket does, although its popularity is growing; unfortunately, that popularity almost always leads to development. It’s an ironic twist considering it’s the lack of development that draws many visitors in the first place. In addition to beaches, the island is home to some amazing Buddhist temples, wildlife preserves, and local markets full of exotic fruits, vegetables, and spices not often seen in the west. 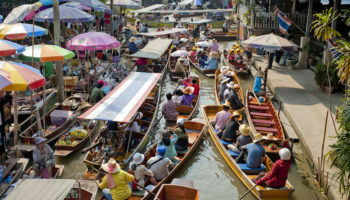 The island is reachable by ferry from the mainland, and there’s also an international airport that receives regional flights from large urban centers like Bangkok. The island’s relatively large size makes it more compartmentalized than some smaller ones, but for nearly every traveler – regardless of age, budget or expectations – there’s a beach in Koh Samui that’s the perfect fit. 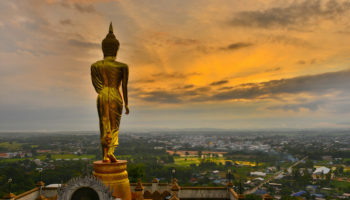 From all-inclusive 5-star resorts to backpacker’s hostels, and swanky, expensive hotel restaurants to local street food vendors selling grilled squid and prawns for just a few bucks, unlike many destinations that claim to be unique and diverse, Koh Samui really is. Since there are so many choices, it’s best to carefully consider what it is that you want to do, how much you want to spend, and who you want to rub elbows with while on vacation before biting the bullet and booking your transportation and lodging. Unlike many of the beaches on Koh Samui, Thongson Bay’s sand isn’t bright white but a soft grey, due to its composition of broken seashells and time-worn pebbles. Don’t worry if white beaches are your thing; Thongson Bay is still beautiful in its own right. On the plus side, it doesn’t reflect the sun’s harsh rays like a white beach does, so you’re less likely to get an uncomfortable sunburn while laying out at Thongson Bay. The beach is on a peninsula that juts out into the Gulf of Thailand on the northeast corner of the island and sits in the bottom of a crescent-shaped depression facing northward. More rugged and undeveloped than many of the island’s beaches, Thongson Bay is known for its relatively slow pace and serenity and is perfectly framed by green hills and lush stands of palm trees that make their way right to the beach’s edge. For those travelers who’d rather avoid the crowds while in Koh Samui, Bang Po Beach would be one of the best places to do just that. You won’t find multi-star, high-rise resorts nearby, but you will find a few no-frills family restaurants known for their simple and fresh dishes and cold drinks. Bang Po is one of the island’s longest beaches. Lying on its northwest corner, it is a favorite destination for retirees and those looking to escape the hectic chaos of their lives in the west. Bang Po Beach lies between Laem Yai to the west and Maenam to the east, and is often more populated with local fisherman than it is with tourists. The water is very shallow and has a sandy bottom; at low tide, sand flats stretch a hundred yards or more outward as the water retreats, making it a particularly kid-friendly swimming area. Due mainly to its proximity to the Anthong Marine National Park, Taling Ngam is one of the cleanest and most picturesque of all of Koh Samui’s beaches, and it probably won’t be overdeveloped anytime soon. It’s located on the island’s southwest corner nearest to the mainland, making it a convenient option for those who’d rather get their fill of quality beach time instead of exploring. 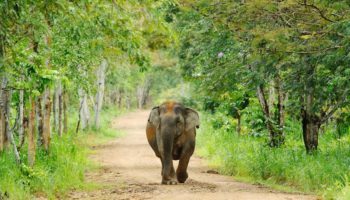 Taling Ngam’s remoteness is its greatest asset for many visitors, but for those who prefer to be close to town, it’s probably not a good choice. Nathon is the largest nearby town and is about 20 minutes away by taxi, and Chaweng is about an hour. There are more than a few notable restaurants nearby, most of which serve a nice mix of western and traditional Thai dishes. For the most part, the accommodation in Taling Ngam consists of relatively inexpensive bungalows and hostels catering to the laid-back, budget-conscious segment of the tourist market. 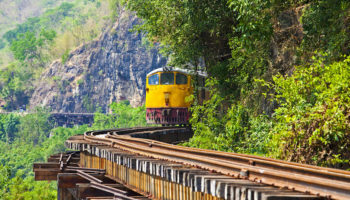 Lipa Noi’s proximity to the island’s ferry port makes it a great choice for visitors who want to hit the beach without wasting valuable time traveling all over the island needlessly. Lipa Noi is one of the islands best swimming beaches due to its white sand and the lack of underwater dangers, like jagged chunks of rock and coral found on some of the island’s other beaches. The water is shallow and increases very gradually, making it possible for an adult to stand with their head above water more than 100 meters out. Lipa Noi is home to some of the island’s most popular seafood restaurants. Likewise, the lodging options run the full range to fit nearly every travel budget. The waterfront sports a few ritzy seaside villas, but there are inexpensive bungalows available that are just a hop, skip, and jump from the beach too. Lipa Noi doesn’t have the reputation as a party beach, so you’ll find that most visitors are slightly older than they are elsewhere, making it the perfect place for those who like to pack it in early or are traveling with children. 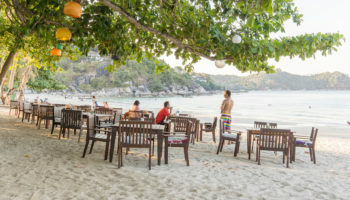 Located in a shallow crescent on the island’s northeast corner, Choeng Mon Beach is surrounded by an impressive variety of eating, drinking, and lodging establishments catering to those of nearly all tastes and budgets. Considered one of the island’s more upscale locales, Choeng Mon Beach’s backdrop is dominated by a few luxurious multi-star resorts that are the perfect choices for those who want to be pampered and are willing to pay for it. If 5-star resorts are your cup of tea, you’ll be happy staying in one of Choeng Mon Beach’s nice hotels like the White House or the Imperial Boat House; with nearly all the amenities you’ll need onsite, you’ll only have to venture out if you really want to. Many previous guests to Koh Samui have said that of all the beaches they visited, Choeng Mon Beach was their favorite. Located a few kilometers east of Bang Po Beach, Maenam Beach faces north into the Gulf of Thailand from the island’s north-central coast, about 15 kilometers south of its northern island neighbor of Ko Phangan. For adult swimmers, Maenam is one of the best beaches in Koh Samui because the water gets deeper more quickly than at most other island beaches. In many ways, Maenam Beach is the best of both worlds in that it offers beautiful and only moderately developed natural scenery. There’s just the right mix of restaurants, bars, and hotels to make getting the things you need easy without being overwhelming. In general, Maenam Beach is in the middle of the road in many categories, making it a popular destination and one of the island’s most well-rounded locations attracting a varied group of international visitors. Known for its alluring Fisherman’s Village, exotic local markets, and swanky, comfortable seaside resorts and restaurants, Bophut Beach has a little something for everyone. Much of the architecture in the area around Bophut Beach is a unique mix of Chinese and Thai, giving it a distinct look and feel that most visitors find fascinating. Bophut Beach is a narrow arc filled with white sand and framed by majestic clusters of palm trees. For those interested in doing some cultural sightseeing, the Big Buddha Temple just inland is a magnificent place that’s well worth the trip, especially for those who’ve never seen a real-life Buddhist Temple up close and personally. Dining and lodging options abound, and unlike many other nearby beaches, there’s plenty to see and do to fill your time if you can only stand laying on the beach for an hour or two at a time. Located on the island’s west-central coast, Ban Tai Beach is conveniently close to Thong Sala Pier and Raja Ferry Dock, making it a convenient beach to get to quickly for those on a tight schedule. Like all of Koh Samui’s beaches, Ban Tai doesn’t lack in the aesthetics department, and sports towering palms, shimmering blue water, and bright, inviting beaches that look like they just leaped off the pages of a travel magazine. Ban Tai Beach does have a wide strip of seagrass just offshore, and there are the occasional underwater rocks that can make it possible to stub a toe or bang a shin if you’re not careful, but it’s possible to buy an inexpensive pair of rubberized shoes at a local tourist shop to wear in the water if you’ll be swimming at Ban Tai. From the ferry port, the road to Ban Tai is full of eateries, hotels, and hostels at nearly every price point. After Chaweng, Lamai Beach is Koh Samui’s largest and most popular beach. 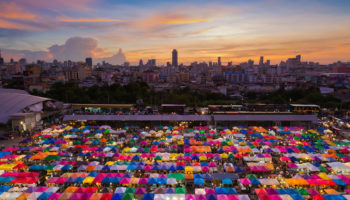 Though it offers guests an array of amenities, it’s generally less chaotic than is Chaweng, making it a good choice for first-time visitors looking for a slower and more relaxed pace. 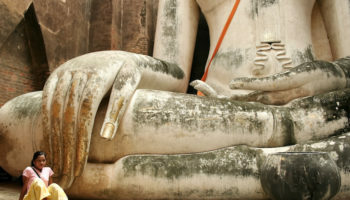 Part of Lamai’s charm is that it’s slightly older and less developed than Chawing, giving it a noticeably quainter feel. Many guests who’ve visited both Chaweng and Lamai have said that they preferred Lamai for the above reasons. Also, it’s beach has less current, making it an easier and safer place to swim, especially for those with children. 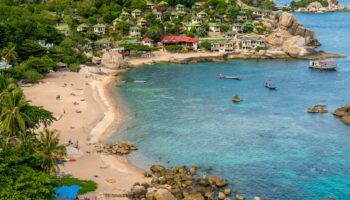 Sadly, as is the case with many areas, new resorts and an uptick in development is driving out the traditional feel; it seems that that’ll eventually happen to Lamai Beach as well, although it’s still probably at least a few years away. Located right in the center of Koh Samui’s eastern coast, Chaweng Noi Beach is known for its clean water and fun-loving crowd. 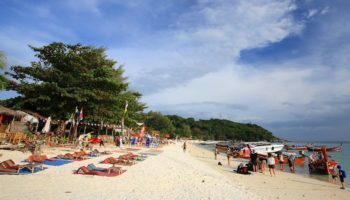 Chaweng Noi Beach is adjacent to other Chaweng beaches, but they’re separated by a narrow inlet that acts as a natural barrier, which tends to keep the crowds and beach debris to a minimum making it feel more secluded than it really is. Chaweng Noi has enough activities available to keep most guests satisfied. Though there are more than a few lodging and dining options, it’s got a decidedly less touristy feel than some other beaches that are just a stone’s throw away. The sea and coast vistas at Chawing Noi are second to none, and the beach is wider and whiter than many others. As the water’s depth increases, the water changes into ever-darkening hues of blue that are quite a beautiful spectacle, as are the sunrises due to its east-facing orientation. For those determined travelers who won’t settle for anything less than the best, Chaweng Beach arguably packs the best bang for those hard-earned travel dollars. It’s a stone’s throw from the airport, Angthong National Marine Park, and a popular Muay Thai kickboxing stadium too. Chaweng Beach also has a reputation as a place to party and has a noticeably younger crowd than other island beaches. It’s conveniently located near three hospitals, which will come in handy if those pre-lunch tequila shots go to your head. Not to be outdone in the beach department, Chaweng features stunning scenery that’s chock-full of beautiful vistas only broken up by palm trees, beachgoers, and the occasional seaside resort or bungalow. For those looking to get the evening kicked off with great music, trendy eateries, and tropical cocktails, the Green Mango Strip is an excellent place to start; you’ll likely meet other young, happy-go-lucky travelers from all over the world. Characterized by the majestic boulders jutting from its aquamarine water and stretches of ruggedly beautiful beaches reminiscent of Tom Hanks’ island sanctuary in Castaway, Silver Beach is one of the most beautiful beaches you’ll likely ever see no matter where your travels take you. By size, Silver Beach is one of the island’s smallest, and it’s also home to a few of the island’s original resorts that have been catering to foreign travelers for decades. Crystal Bay Beach Resort and Silver Beach Resort are a few of the most popular, sporting private stretches of beach that are typically reserved for their guests, but rumor has it that it’s really a public beach and that they just post the no trespassing signs to keep the riff-raff out. Snorkeling is particularly fun in the clear, boulder-strewn waters, and depending on the tide, you’re likely to see a variety of fish and marine crustaceans.